Hi, let me introduce my research carried out in at NII as a Ph.D. candidate. Cloud computing has changed our living and business dramatically during the last decade. Amazon, Salesforce and other dotcom companies operate some hundreds of thousands of computers and provide various services through the internet. In the near future, more service providers will compete with each other to offer commoditized services. Users will choose a service fit for their deadlines and budgets, or will combine multiple services to achieve complex task. 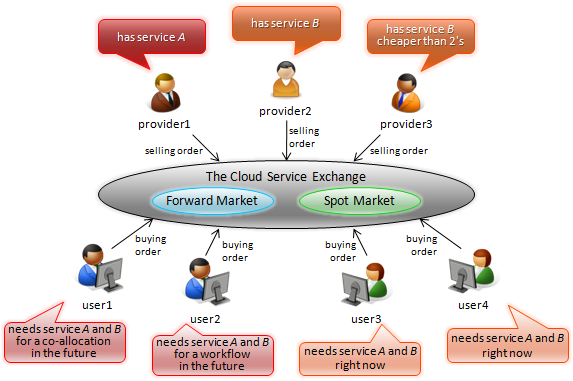 My research goal is to design the Cloud Resource Exchange, where many providers and users sell/buy cloud services (i.e. resources). The combinational auctions mechanism, which allows participants to trade a combination of multiple goods, will be suitable for trading cloud services. I am now carrying out research on an effective design of the Cloud Service Exchange. My Ph.D. thesis titled “Study on Combinatorial Marketplace for Cloud Computing Services” has been published on March 2012. This entry was posted in Research by ikki. Bookmark the permalink.